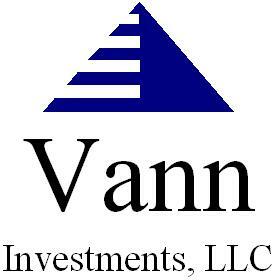 Vann Investments, LLC is a fee only Investment Advisory Consulting company that actively manages client portfolios, as well as working with third party investment managers. At Vann Investments, LLC we believe that by tying all parties compensation to the growth of our clients assets. We are able to maximize the possibility of our clients achieving their financial goals. At Vann Investments, LLC we offer ourValue Portfolio in addition to third party managers listed on our Services page. The Value Portfolio seeks above market rates of return on a risk adjusted basis from taking advantage of the short term irrational nature of market movements. Yet making long term investment decisions. This portfolio provides a high degree of current income through investing in companies that have a demonstrated history of paying and raising dividends. Our founder, Thomas D. Vann applys his knowledge gained through nearly four decades as an investment professional to recoginize extreme valuations. "I've watched the world come to an end several times. Each time I've bet against it and have been handsomely rewarded." New portfolios only have positions established in issues that have at least a 40% appreciation potential based on our analysis. It is not unusual for cash and fixed income positions to exceed 50% of account value if in our opinion the equity markets are overvalued. In order to assist our clients with their investing needs we offer a wide variety of vehicles to cover the spectrum of account sizes. Information on each custodian is available upon request. Not a good start for the year. Other than the first trading day of the year the DJIA has traveled over 200 points, or more (up and down) every trading day for the month. This is one of the most volatile months that I can remember. Usually excessive volatility is a bad sign. As you can see all three major averages were down. The DJIA gave up over 1/2 the gains for all of last year. Large Caps that also operate overseas were especially hit due to the effects of the strong dollar versus other currencies. Oil & Gas companies and any one associated with the industry were hit the hardest. These companies are looking very attractive and I am looking to add the largest in the industry to the portfolios. Those who were telling us $100 oil was here to stay are now saying we will never see $100 again. Oil is cyclical and we have seen high and low prices before and I believe we will do so again. At below $45 a barrel the oil companies and their suppliers are looking very attractive for the long term and the dividend yields are in excess of 4%. During the month I added Freeport McMoran to the portfolios. I am attaching an two S&P reports on the company. One the day of the purchase and one from today. At the time of purchase it paid a yield of 5.28%. It was purchased at 22.82 a share down from its 52 week high of 39.32. While I like the long term prospects and believe the company to be undervalued it has continued to drop and closed at 16.81 on 1/30/2015. Towards the end of the month many of the major companies of the DJIA and S&P 500 began reporting lower earnings on lower revenues. It appears that the limits of financial manipulation may have been reached. Over the last 18 months companies had been reporting higher earnings on lower revenues. This had primarily been achieved by downsizing and reducing the float of outstanding shares through companies buying back their own stock. It appears that the limits on both of those may have been reached. As you are aware I have been extremely critical of the Federal Reserve's monetizing the debt through Quantitative Easing. The Fed now finds itself in a box. They need to begin to raise rates to restore balance to the monetary system and stop currency war with the Dollar versus the Yen versus the Euro. We saw the first casualty two weeks ago when Switzerland decided enough is enough. They opted out of supporting the Euro, and the Swiss Franc appreciated 30% in one day. It has had an immediate deleterious effect on Swiss exports. The Swiss have decided that sound monetary policy, no matter the short term pain is vital to the long term stability of their economy. The United States is now beginning to fell the effects of an inadvertent strong dollar. One of the unintended consequences of Quantitative Easing was to devalue the U.S. Dollar versus foreign currencies. However, if the Federal Reserve raises rates to stop the "race to the bottom" for currency valuations it is going to result in an even higher dollar and further decreasing the top and bottom line results for major corporations at an accelerating rate. The Fed is hoping to manage this in a controlled manner. Just as the Fed created the housing "bubble" and then took the punch bowl away they have created a "bubble" in both equities and bonds. Bubbles only end one way, they burst. We have been here many times over the last 18 months. Each time we were about to plunge over the cliff we saw orchestrated moves by the Federal Reserve and foreign Central Banks around the world ride to the rescue. I don't know if they will be able to do it again. However, on January 28th the FOMC (Federal Open Market Committee) announced their commitment to zero interest rates for the wealthiest of the wealthy once again. Right on cue the decline stopped and the market rose 100 points. Then something strange happened, the market as measured by the DJIA turned and dropped 195 points by the end of the day. On a positive note. Our excess cash reserves will allow us to take advantage of any substantial declines and the values presented. As always, please contact me with any questions or if you would like to get together to go over your portfolio. Copyright 2010 Vann Investments, LLC. All rights reserved.